Anschluss (German: [ˈʔanʃlʊs] ( listen) "joining") refers to the annexation of Austria into Nazi Germany on 12 March 1938. The word's German spelling, until the German orthography reform of 1996, was Anschluß and it was also known as the Anschluss Österreichs ( pronunciation (help·info), English: Annexation of Austria). The idea of an Anschluss (a united Austria and Germany that would form a "Greater Germany")[a] began after the unification of Germany excluded Austria and the German Austrians from the Prussian-dominated German Empire in 1871. 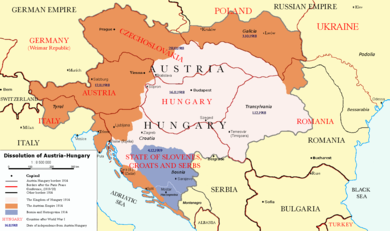 Following the end of World War I with the fall of the Austro-Hungarian Empire, in 1918, the newly formed Republic of German-Austria attempted to form a union with Germany, but the Treaty of Saint Germain (10 September 1919) and the Treaty of Versailles (28 June 1919) forbade both the union and the continued use of the name "German-Austria" (Deutschösterreich); and stripped Austria of some of its territories, such as the Sudetenland. 7.1 Anschluss: annexation or union? 7.3.2 Austrian identity and the "victim theory"
The idea of grouping all Germans into one nation-state had been the subject of debate in the 19th century from the dissolution of the Holy Roman Empire in 1806 until the break-up of the German Confederation in 1866. Austria had wanted a Großdeutsche Lösung (greater Germany solution), whereby the German states would unite under the leadership of the German Austrians (Habsburgs). This solution would have included all the German states (including the non-German regions of Austria), but Prussia would have had to take second place. This controversy, called dualism, dominated Prusso-Austrian diplomacy and the politics of the German states in the mid-nineteenth century. In 1866 the feud finally came to an end during the German war in which the Prussians successfully defeated the Austrians and thereby excluded Austria and the German Austrians from Germany. The Prussian statesman Otto von Bismarck formed the North German Confederation, which included the remaining German states and further expanded the power of Prussia. Bismarck used the Franco-Prussian war (1870-1871) as a way to convince other German states, including the Kingdom of Bavaria, to side with Prussia against the Second French Empire. Due to Prussia's quick victory, the debate was settled and in 1871 the "Kleindeutsch" German Empire based on the leadership of Bismarck and the Kingdom of Prussia formed - this excluded Austria. In the aftermath of a prohibition of an Anschluss, the Germans in both Austria and Germany pointed to a contradiction in the national self-determination principle because it failed to grant it to the ethnic Germans (such as German Austrians and Sudeten Germans) outside of the German Reich. The Treaty of Versailles and the Treaty of Saint-Germain (both signed in 1919) explicitly prohibited the political inclusion of Austria in the German state. This measure was criticized by Hugo Preuss, the drafter of the German Weimar Constitution, who saw the prohibition as a contradiction of the Wilsonian principle of self-determination of peoples, intended to help bring peace to Europe. Following the destruction of World War I, however, France and Britain feared the power of a larger Germany and had begun to disempower the current one. Austrian particularism[clarification needed], especially among the nobility, also played a role in the decisions; Austria was Roman Catholic, while Germany was dominated by Protestants, especially in government (the Prussian nobility, for example, was Lutheran). The constitutions of the Weimar Republic and the First Austrian Republic included the political goal of unification, which was widely supported by democratic parties. In the early 1930s, popular support in Austria for union with Germany remained overwhelming, and the Austrian government looked to a possible customs union with the German Republic in 1931. When the Nazis, led by Adolf Hitler, rose to power in the Weimar Republic, the Austrian government withdrew from economic ties. Austria shared the economic turbulence of the Great Depression, with a high unemployment rate, and unstable commerce and industry. During the 1920s it was a target for German investment capital. By 1937, rapid German rearmament increased Berlin's interest in annexing Austria, rich in raw materials and labour. It supplied Germany with magnesium and the products of the iron, textile and machine industries. It had gold and foreign currency reserves, many unemployed skilled workers, hundreds of idle factories, and large potential hydroelectric resources. Hitler, an Austrian German by birth,[b] picked up his German nationalist ideas at a young age. Whilst infiltrating the German Workers' Party (DAP), Hitler became involved in a heated political argument with a visitor, a Professor Baumann, who proposed that Bavaria should break away from Prussia and found a new South German nation with Austria. In vehemently attacking the man's arguments he made an impression on the other party members with his oratory skills and, according to Hitler, the "professor" left the hall acknowledging unequivocal defeat. 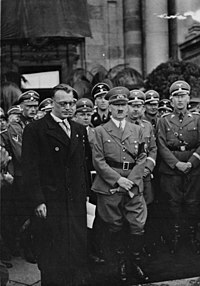 Impressed with Hitler, Anton Drexler invited him to join the DAP. Hitler accepted on September 12, 1919, becoming the party's 55th member. After becoming leader of the DAP, Hitler addressed a crowd on February 24, 1920, and in an effort to appeal to wider parts of the German population, the DAP was renamed the National Socialist German Workers' Party (NSDAP). Power was centralized in the office of the chancellor, who was empowered to rule by decree. The dominance of the Christian Social Party (whose economic policies were based on the papal encyclical Rerum novarum) was an Austrian phenomenon. Austria's national identity had strong Catholic elements that were incorporated into the movement, by way of clerical authoritarian tendencies not found in Nazism. 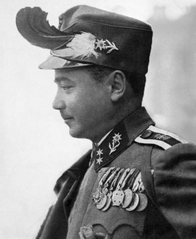 [example needed] Engelbert Dollfuss and his successor, Kurt Schuschnigg, turned to Benito Mussolini's Italy for inspiration and support. The statist corporatism often referred to as Austrofascism bore more resemblance to Italian Fascism than to German National Socialism, has been described as a form of clerical fascism. Mussolini supported the independence of Austria, largely due to his concern that Hitler would eventually press for the return of Italian territories once ruled by Austria. However, Mussolini needed German support in Ethiopia (see Second Italo-Abyssinian War). After receiving a personal assurance from Hitler that Germany would not seek territorial concessions from Italy, Mussolini began a client relationship with Berlin that began with the 1937 Berlin–Rome Axis. 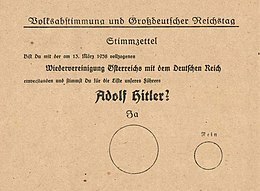 The Austrian Nazi Party failed to win any seats in the November 1930 general election, but its popularity grew in Austria after Hitler came to power in Germany. The idea of the country joining Germany also grew in popularity, and Anschluss might have occurred by democratic process had Austrian Nazis not begun a terrorism campaign. John Gunther wrote in 1936, "In 1932 Austria was probably eighty percent pro-Anschluss". 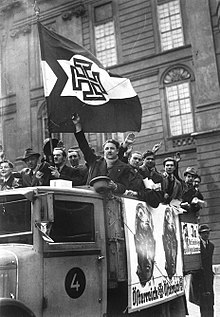 When Germany permitted residents of Austria to vote[clarification needed] on March 5, 1933, three special trains, boats and trucks brought such masses to Passau that the SS staged a ceremonial welcome. Gunther wrote that by the end of 1933 Austrian public opinion about German annexation was at least 60% against. On 25 July 1934, Dollfuss was assassinated by Austrian Nazis in a failed coup. Afterwards, leading Austrian Nazis fled to Germany but they continued to push for unification from there. 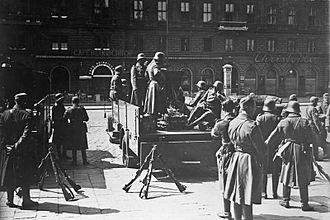 The remaining Austrian Nazis continued terrorist attacks against Austrian governmental institutions, causing a death toll of more than 800 between 1934 and 1938. 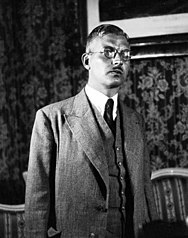 Dollfuss's successor was Kurt Schuschnigg, who followed a political course similar to his predecessor. In 1935 Schuschnigg used the police to suppress Nazi supporters. Police actions under Schuschnigg included gathering Nazis (and Social Democrats) and holding them in internment camps. The Austrofascism of Austria between 1934–1938 focused on the history of Austria and opposed the absorption of Austria into Nazi Germany (according to the philosophy Austrians were "superior Germans"). Schuschnigg called Austria the "better German state" but struggled to keep Austria independent. In an attempt to put Schuschnigg's mind at rest, Hitler delivered a speech at the Reichstag and said, "Germany neither intends nor wishes to interfere in the internal affairs of Austria, to annex Austria or to conclude an Anschluss." 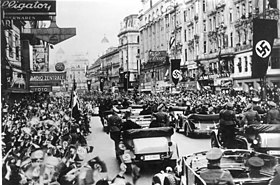 Supporters of Schuschnigg campaigning for the independence of Austria in March 1938, shortly before the Anschluss. Hitler told Goebbels in the late summer of 1937 that eventually Austria would have to be taken "by force". On 5 November 1937, Hitler called a meeting with the Foreign Minister Konstantin von Neurath, the War Minister Field Marshal Werner von Blomberg, the Army commander General Werner von Fritsch, the Kriegsmarine commander Admiral Erich Raeder and the Luftwaffe commander Herman Göring recorded in the Hossbach Memorandum. At the conference, Hitler stated that economic problems were causing Germany to fall behind in the arms race with Britain and France, and that the only solution was to launch in the near-future a series of wars to seize Austria and Czechoslovakia, whose economies would be plundered to give Germany the lead in the arms race. In early 1938, Hitler was seriously considering replacing Papen as ambassador to Austria with either Colonel Hermann Kriebel, the German consul in Shanghai or Albert Forster, the Gauleiter of Danzig. Significantly, neither Kriebel nor Forster were professional diplomats with Kriebel being one of the leaders of 1923 Munich Beerhall putsch who had been appointed consul in Shanghai to facilitate his work as an arms dealer in China while Forster was a Gauleiter who had proven he could get along with the Poles in his position in the Free City of Danzig; both men were Nazis who had shown some diplomatic skill. On 25 January 1938, the Austrian police raided the Vienna headquarters of the Austrian Nazi Party, arresting Gauleiter Leopold Tavs, the deputy to Captain Josef Leopold, discovered a cache of arms and plans for a putsch. On 20 February, Hitler made a speech before the Reichstag which was broadcast live and which for the first time was relayed also by the Austrian radio network. A key phrase in the speech which was aimed at the Germans living in Austria and Czechoslovakia was: "…The German Reich is no longer willing to tolerate the suppression of ten million Germans across its borders." Hitler crosses the border into Austria in March 1938. Hitler announces the Anschluss on the Heldenplatz, Vienna, 15 March 1938. That afternoon, Hitler, riding in a car, crossed the border at his birthplace, Braunau am Inn, with a 4,000 man bodyguard. In the evening, he arrived at Linz and was given an enthusiastic welcome. The enthusiasm displayed toward Hitler and the Germans surprised both Nazis and non-Nazis, as most people had believed that a majority of Austrians opposed Anschluss. Many Germans from both Austria and Germany welcomed the Anschluss as they saw it as completing the complex and long overdue German unification of all Germans united into one-state. Hitler had originally intended to leave Austria as a puppet state with Seyss-Inquart as head of a pro-Nazi government. However, the overwhelming reception caused him to change course and absorb Austria into the Reich. 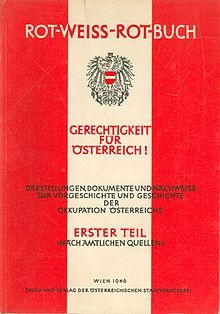 On 13 March Seyss-Inquart announced the revocation of Article 88 of the Treaty of Saint-Germain, which prohibited the unification of Austria and Germany, and approved the replacement of the Austrian states with Reichsgaue. The seizure of Austria demonstrated once again Hitler's aggressive territorial ambitions, and, once again, the failure of the British and the French to take action against him for violating the Versailles Treaty. Their lack of will emboldened him toward further aggression. Immediately after the Anschluss, Vienna’s Jews were forced to wash pro-independence slogans (Reibpartie [de]) from the city’s pavements. The campaign against the Jews began immediately after the Anschluss. They were driven through the streets of Vienna, their homes and shops were plundered. Jewish men and women were forced to wash away pro-independence slogans painted on the streets of Vienna ahead of the failed 13 March plebiscite. Jewish actresses from the Theater in der Josefstadt were forced to clean toilets by the SA. The process of Aryanisation began, and Jews were driven out of public life within months. These events reached a climax in the Kristallnacht pogrom of 9–10 November 1938. All synagogues and prayer houses in Vienna were destroyed, as well as in other Austrian cities such as Salzburg. The Stadttempel was the sole survivor due to its location in a residential district which prevented it from being burned down. Most Jewish shops were plundered and closed. Over 6,000 Jews were arrested overnight, the majority deported to Dachau concentration camp in the following days. The Nuremberg Laws applied in Austria from May 1938, later reinforced with innumerable anti-Semitic decrees. Jews were gradually robbed of their freedoms, blocked from almost all professions, shut out of schools and universities, and forced to wear the Yellow badge from September 1941. The Nazis dissolved Jewish organisations and institutions, hoping to force Jews to emigrate. Their plans succeeded—by the end of 1941, 130,000 Jews had left Vienna, 30,000 of whom went to the United States. They left behind all of their property, but were forced to pay the Reich Flight Tax, a tax on all émigrés from Nazi Germany; some received financial support from international aid organisations so that they could pay this tax. The majority of the Jews who had stayed in Vienna eventually became victims of the Holocaust. Of the more than 65,000 Viennese Jews who were deported to concentration camps, fewer than 2,000 survived. Austria in the first days of Nazi Germany's control had many contradictions: at one and the same time, Hitler's regime began to tighten its grip on every aspect of society, beginning with mass arrests as thousands of Austrians tried to escape; yet other Austrians cheered and welcomed the German troops entering their territory. 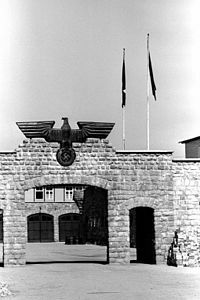 In March 1938 the local Gauleiter of Gmunden, Upper Austria, gave a speech to the local Austrians and told them in plain terms that all "traitors" of Austria were to be thrown into the newly opened concentration camp at Mauthausen-Gusen. The camp became notorious for its cruelty and barbarism. During its existence an estimated 200,000 people died, half of whom were directly killed. The antigypsy sentiment was implemented initially most harshly in Austria when between 1938-1939 the Nazis arrested around 2,000 Gypsy men whom were sent to Dachau and 1,000 Gypsy women whom were sent to Ravensbrück. Starting in 1939, Austrian Gypsies had to register themselves to local authorities. The Nazis began to publish articles linking the Gypsies with criminality. Until 1942, the Nazis had made a distinction between "pure Gypsies" and "Gypsy Mischlinges. However, Nazi racial research claimed that 90% of Gypsies were of mixed ancestry. Subsequently, the Nazis ordered that the Gypsies were to be treated on the same level as the Jews. 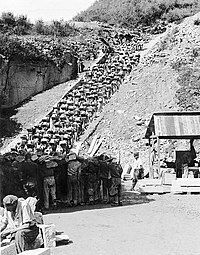 "Stairs of Death" at Mauthausen-Gusen with prisoners forced to carry a granite block up 186 steps to the top of the quarry. 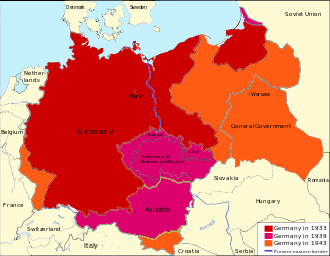 A map showing the border changes of Germany in the various years 1933 (red), 1939 (pink) and 1943 (orange). "Red-White-Red Book" published by the Austrian Ministry of Foreign Affairs in 1946 describes the events of Austria between 1938-1945 by the Founders of the Second Austrian Republic. It has also helped the Austrians develop their own national identity as before. After World War II and the fall of Nazi Germany the political ideology of Pan-Germanism fell into disfavor and is now seen by the majority of German-speaking people as taboo. Unlike earlier in the 20th century when there was no Austrian identity separate from a German one, in 1987 only 6% of the Austrians identified themselves as "Germans." A survey carried out in 2008 found that 82% of Austrians considered themselves to be their own nation. 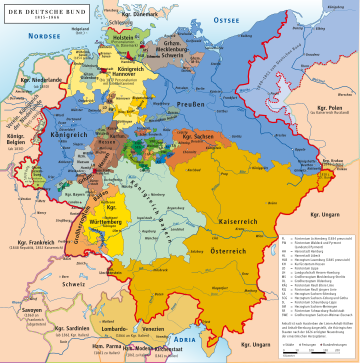 ^ After the Prussian-dominated German nation-state was created in 1871 without Austria, the German question was still very active in most parts of the ethnic German lands of the Austro-Hungarian and German empires; the Austrian pan-Germans were in favour of a Pan-German vision of Austria joining Germany in order to create a "Greater Germany" and the Germans inside the German Empire were in favour of all Germans being unified into a single state. ^ Hitler was an ethnic German, but was not a German citizen by birth since he had been born in the Austro-Hungarian empire. He gave up his Austrian citizenship in 1925 and remained stateless for seven years before he became a German citizen in 1932. ^ "Anschluss". Britannica. Retrieved 2014-21-05. ^ Bukey 2002, p. 11. ^ a b c Shirer 1984. ^ Low 1974, p. 3. ^ Sheehan, James J. (1993). German History, 1770–1866. Oxford University Press. p. 851. ^ Unowsky, Daniel L. (2005). The Pomp and Politics of Patriotism: Imperial Celebrations in Habsburg Austria, 1848–1916. Purdue University Press. p. 157. ^ Giloi, Eva (2011). Monarchy, Myth, and Material Culture in Germany 1750–1950. Cambridge University Press. pp. 161–162. ^ Zeman 1973, pp. 137-142. ^ Gould, S. W. (1950). "Austrian Attitudes toward Anschluss: October 1918 – September 1919". Journal of Modern History. 22 (3): 220–231. JSTOR 1871752. ^ Stackelberg 1999, p. 194. ^ Taylor, Alan John Percivale (2001). The Course of German History: A Survey of the Development of German History Since 1815. Routledge. pp. 257–. ISBN 978-0-415-25405-2. ^ Lemons, Everette O. (2005). The Third Reich, A Revolution of Ideological Inhumanity. Volume I "The Power of Perception". CreateSpace Independent Publishing Platform. p. 118. ISBN 978-1-4116-1932-6. Retrieved 7 December 2012. ^ Hitler, Adolf (June 2010). Mein Kampf. Bottom of the Hill. ISBN 978-1-935785-07-1. ^ a b c Gunther, John (1936). Inside Europe. Harper & Brothers. pp. 284–285, 317–318. ^ Shirer 1990, p. 296. ^ a b c Kershaw 2001, p. 67. ^ a b Kershaw 2001, pp. 67-68. ^ a b c Kershaw 2001, p. 68. ^ Kershaw 2001, p. 45. ^ Carr, William Arms, Autarchy and Aggression pages 73–78. ^ a b c Weinberg 1981, p. 46. ^ John A. Leopold, "Seyss-Inquart and the Austrian Anschluss," Historian (1986) 30#2 pp 199–218. ^ Price, G. Ward (1939). Year of Reckoning. London: Cassell. p. 92. ^ a b "Hitler Triumphant: Early Diplomatic Triumphs". ^ See 'Vienna, 1938', in Hans Keller, 1975: 1984 minus 9, Dennis Dobson, 1977, p. 28 Mayerhofer (1998). "Österreichs Weg zum Anschluss im März 1938" (in German). Wiener Zeitung Online. Retrieved 11 March 2007. Detailed article on the events of the Anschluss, in German. ^ ORT, World. "Music and the Holocaust". ^ W. Carr, Arms, Autarky and Aggression: A study in German Foreign Policy, 1933–1939, (Southampton, 1981) p.85. ^ a b c MacDonogh, Giles (2009). 1938. Basic Books. pp. 35–36. ISBN 978-0-465-02012-6. ^ Surprised or not, Hitler’s schoolboy dream of a "greater Germany" had come to fruition when Austria was incorporated into the Reich. Ozment (2005), p.274. ^ a b Stackelberg 1999, p. 170. ^ Liulevicius, Vejas Gabriel (2009). The German Myth of the East: 1800 to the Present. New York: Oxford University Press. p. 184. ^ Original German: "Als Führer und Kanzler der deutschen Nation und des Reiches melde ich vor der deutschen Geschichte nunmehr den Eintritt meiner Heimat in das Deutsche Reich." ^ "Video: Hitler proclaims Austria's inclusion in the Reich (2 MB)". Retrieved 11 March 2007. ^ "Anschluss". Archived from the original on 21 June 2005. ^ Giblin, James (2002). The Life and Death of Adolf Hitler. Houghton Mifflin Harcourt. p. 110. ISBN 0-395-90371-8. ^ Toland, John (2014). Adolf Hitler: The Definitive Biography. Knopf Doubleday Publishing Group. p. 450. ISBN 978-1-101-87277-2. ^ a b "Die propagandistische Vorbereitung der Volksabstimmung". Austrian Resistance Archive. 1988. Archived from the original on 4 April 2007. Retrieved 11 March 2007. 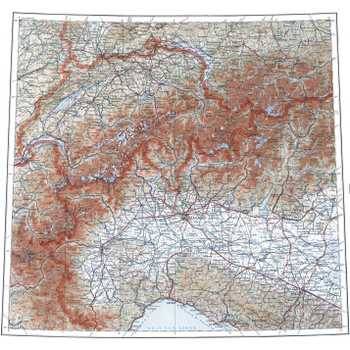 ^ Austria: A Country Study. Select link on left for The Anschluss and World War II. Eric Solsten, ed. (Washington, D. C.: Federal Research Division of the Library of Congress, 1993). ^ Staff (ndg). "Austria". United States Holocaust Memorial Museum. ^ Staff (ndg). "Anschluss". United States Holocaust Memorial Museum. ^ Österreich, Außenministerium der Republik. "Joint communiqué by Austria and Mexico on the occasion of the 70th anniversary of the Mexican protest against the "Anschluss" of Austria by Nazi Germany – BMEIA, Außenministerium Österreich". ^ Snyder, Timothy (2015). Black Earth: The Holocaust as History and Warning. Crown/Archetype. pp. 77–81. ISBN 978-1101903452. ^ Maria Kohl, Katrin; Ritchie, Robertson (2006). A History of Austrian Literature 1918-2000. Camden House. p. 7. ISBN 978-1-57113-276-5. ^ McKale, Donald (2006). Hitler's Shadow War: The Holocaust and World War II. Taylor Trade Publishing. p. 109. ISBN 978-1-4616-3547-5. ^ Wistrich, Robert S. (1992). Austrians and Jews in the Twentieth Century: From Franz Joseph to Waldheim. Palgrave Macmillan UK. p. 203. ISBN 978-1-349-22378-7. ^ Pauley 2000, pp. 297-98. ^ a b "1938: Austria". MSN Encarta. Archived from the original on 31 October 2009. Retrieved 11 March 2007. ^ "Anschluss Tirols an NS-Deutschland und Judenpogrom in Innsbruck 1938". ^ Kershaw 2001, p. 83. ^ "Page 32 USACA - Property Control Branch". Fold3. Retrieved 2018-08-11. ^ a b Gellately 2002, p. 69. ^ Gellately 2002, p. 108. ^ a b Gellately 2001, p. 222. ^ a b Gellately 2001, p. 225. ^ Neville Chamberlain, "Statement of the Prime Minister in the House of Commons, 14 March 1938 Archived 25 May 2000 at Archive.today." ^ Shirer 1984, p. 308. ^ Chronology of the League of Nations  Retrieved September 4, 2016. ^ Serrano Migallón, Francisco (2000) Con certera visión: Isidro Fabela y su tiempo. Mexico City: Fondo de Cultura Económica. 2000. pp. 112–113. ISBN 968-16-6049-8. In Spanish. ^ League of Nations. Communication from the Mexican Delegation. C.101.M.53.1938.VII; March 19th, 1938 (Note: Also available in French.) Retrieved September 4, 2016. ^ "Anschluss". Encyclopædia Britannica. Retrieved 11 March 2007. ^ "Moskauer Deklaration 1943 und die alliierte Nachkriegsplanung". ^ Gerald Stourzh, "Waldheim's Austria", The New York Review of Books 34, no. 3 (February 1987). ^ Beniston, Judith (2003). "'Hitler's First Victim'? — Memory and Representation in Post-War Austria: Introduction". Austrian Studies. 11: 1–13. JSTOR 27944673. ^ Art 2006, p. 101. ^ "Österreicher fühlen sich heute als Nation" (in German). 2008. ^ Short note on Schüssel's interview in the Jerusalem Post (in German)[permanent dead link], Salzburger Nachrichten, 11 November 2000. ^ Liukkonen, Petri. "Thomas Bernhard". Books and Writers (kirjasto.sci.fi). Finland: Kuusankoski Public Library. Archived from the original on 17 February 2005. ^ Austrian Historical Commission Archived 21 April 2006 at the Wayback Machine. ^ Hilberg interview with the Berliner Zeitung, Archived 15 July 2012 at the Wayback Machine as quoted by Norman Finkelstein's web site. ^ Efraim Zuroff, "Worldwide Investigation and Prosecution of Nazi War Criminals, 2001–2002 Archived 11 February 2005 at the Wayback Machine," Simon Wiesenthal Center, Jerusalem (April 2002). Stackelberg, Roderick (1999). Hitler's Germany: Origins, Interpretations, Legacies. Routledge & Kegan Paul. ISBN 0415201152. 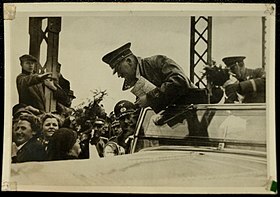 Wikimedia Commons has media related to Anschluss of Austria 1938.